What is the best way to get from the Airport to the tramway (and back again). I have 8 hours between flights, which means i really only have 5 hours available to visit the peak. Is this enough time ? Any idea how many HKD I should have available to pay for transport (bus/taxi), the tramway etc. Yes it is possible to take a bus (CTB A11) from bus stops located at Central area but not directly from the Peak Tram terminal. From Peak Tram Lower terminal --> take the bus 15C to Central Pier --> walk about 10 mins to the Pottinger Street where you can find the bus A11 bus stop no.15 located at 26- 29 Connaught Road Central outside Wing Lung Bank Building to get a bus ride to HK Airport (Ground Transportation Centre). Travel time is about 47 mins @ HK$40. Or, if you can get into the Central MTR station Exit C, the bus stop stated above is just few steps away. I would suggest to follow this link for our sample itinerary for short stay in Hong Kong with detailed instruction in getting there and I think the itinerary #1 will suite your preference. we will arrive 30.03.2012 at 15.30 in Hong Kong International airport and would like to see as much as possible as we are flying out at midnight again. A must is Victoria Peak but some of the temple would be interesting to see as well. Night market, Star ferries, symphony of lights and Lantau island would be also of our interest. Please advice scenic route for around 7 hours and how to get from A to B. Re: Walk whole way? Central-HK Station connected? YES, Central and Hong Kong MTR stations are adjacent and connected to each other (subway). Central station to J1, J2 (exit to Peak Tram), or J3 exits should be about 5 - 8 mins walk. Please refer to the below map. Walk whole way? Central-HK Station connected? I notice you say about 8min by cab. How long to walk to lower tram from HK Station? Are HK Station and Central connected underground? Central to J3 doesn't seem that far. It would take an 8-minute taxi drive at HK$18 from Hong Kong MTR station to the Peak Tram lower terminus. You may opt to walk 6 minutes from Central MTR station exit J2 following directional signs. I am planning to take a taxi from Hong Kong MTR station to the lower peak tram station. How much would it cost and how long would the journey take? A taxi from Central Ferry Pier straight to the Peak Tram is about 10 minutes drive @ HK$25. Actually, the travel distance is about 2 kilometers. If I travel from central ferry to lower peak tram stn by taxi, how much the estimated fare ? Using an Octopus Card for major transportation in Hong Kong like the MTR trains will not only save lot of time but also, it will entitle you for about 1.7% less of fares. * Adult = HK$28 for one way, and HK$40 for round trip. * Child (age 3 - 11) or Senior (age 65 or above) = HK$11 for one way, and HK$18 for round trip. Actually, you can use your octopus card to pay the tickets for the Peak Tram and admission tickets for the Peak attractions (as long as there's enough balance left in your card) but the ticket prices remains the same. 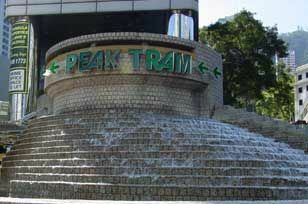 Upon arrival at the Peak Tram, please inquire for some package ticket like "Peak Tram + Sky Terrace" ticket that would give you some discounts. I heard if I take peak tram & pay with octopus I will also get cheaper fare, like taking public transportation. How much the fare? whether it's one way or return. is there also combination fare for entering Madame Tussauds and Sky Terrace by using octopus? Here's How to get to the Victoria Peak tramway from the Airport. After checking out from the Hong Kong International Airport immigration, take the Airport Express Trains which is the fastest way to get you to the city (Hong Kong MTR Station which is adjacent to Central Station). Tickets are station-specific and can be used for 1 return journey on the Airport Express between Airport and the station specified. When you arrive at Hong Kong MTR Station, walk to the adjacent Central MTR Station. Take the Exit J2 then walk towards Peak Tram Terminus on Garden Road which is in between The Bank of China building and The Cheung Kong Centre. The walk to the tram station only takes about 15 to 20 minutes. The Peak Tram tickets are either one-way or return which is more economical. Octopus Card is accepted for paying the fares. THE PEAK TOWER - opens 7:00 am - midnight daily. It offers four signature restaurants with stunning views with numbers innovative casual dining outlets. A very unique festival market style shopping arcade and spectacular special lighting effects. Best time recommended to go up there is early evening. For more information about the Peak and getting there, please click here. Enjoy your Hong Kong trip.